Looking for something to go with last weeks hummus recipe? Try grilling chicken thighs, beef kabobs, or lamb after it has been soaking in this marinade overnite. It makes enough for one to two pounds of meat. For beef, I like to add a tablespoon of meat tenderizer. Cut the beef into kabob size, but do not place on kabobs until ready to grill. For chicken, I like to use boneless skinless chicken thighs and find they do better if not placed on kabobs. This is awesome on lamb chops. I put the rosemary and oregano in my spice grinder and bump a time or two because I like them a little finer. Place meat in a gallon ziplock bag. Add the onions and mix well. Add all remaining ingredients in a bowl and stir well. Pour mixture into bag, mix well, seal and place in refrigerator for at least 24 hours. If using wooden or bamboo skewers soak in water per label instructions before using. As mentioned earlier, if using kabobs, skewer just before cooking time. Remove meat from marinade. Place on grill over high heat, the hot the better, until meat done to your preference. One night last week I woke up at 3am and could not fall back asleep. So I thought about some possible new dishes. This is what I came up with and I tried it out for the Fourth of July. Maybe you could say I dreamed it up. 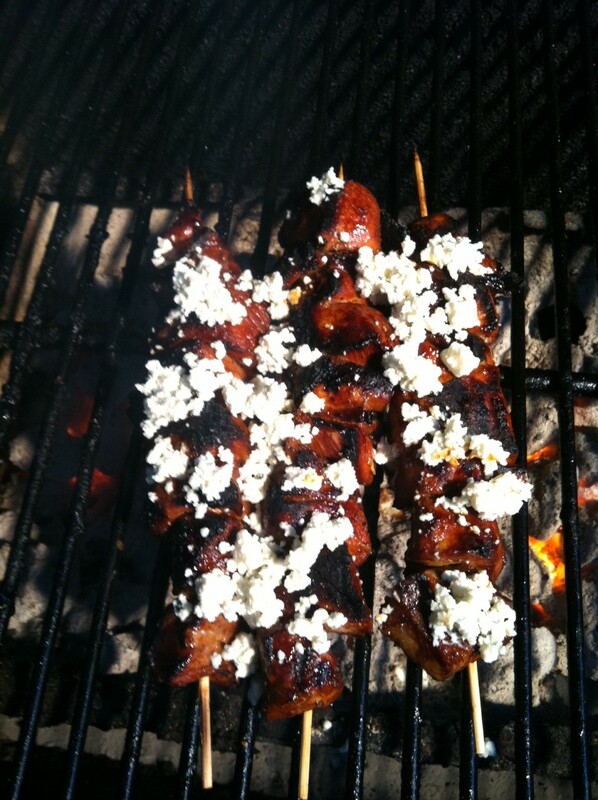 It involves shish kabobs, a marinade, blue cheese and raspberry vinaigrette sauce. I tried it with pork and beef. It came out well enough for me to pass it on. Chicken would work also, but I would not add meat tenderizer to the marinade. Combine all the marinade ingredients and mix well. Place the meat in two separate gallon size ziplock bags. Pour equal parts of the marinade in each bag. Refrigerate for at least 6 hours. Over-nite would be better. Two hours before cooking soak the skewers in water to keep them from burning. 30 minutes before cooking time (or while the charcoal is heating up) pour one cup of the raspberry vinaigrette in a small sauce pan. Bring to a slow boil to reduce it and allow to thicken up. Take the meat out of refrigerator and skewer. I kept the meat together and put veggies on other skewers. I didn’t want the blue cheese and sauce on the veggies. You might like it that way. I see no reason you could not mix it all up. When the grill is ready, place the kabobs on the grill over the heat and start cooking. (I don’t like to crowd my grill. I like to see the glowing coals or gas flames. This allows sufficient heat to pass upwards between the meat.) When the meat is done to your liking push the skewers close together. Now sprinkle the blue cheese over the meat and allow it to slightly melt. Carefully remove the meat and drizzle with the raspberry vinaigrette.